Yesterday I posted about the simple lineside signalling on the MTR underground network: thankfully for a railfan, the East Rail line has a much more interesting system. 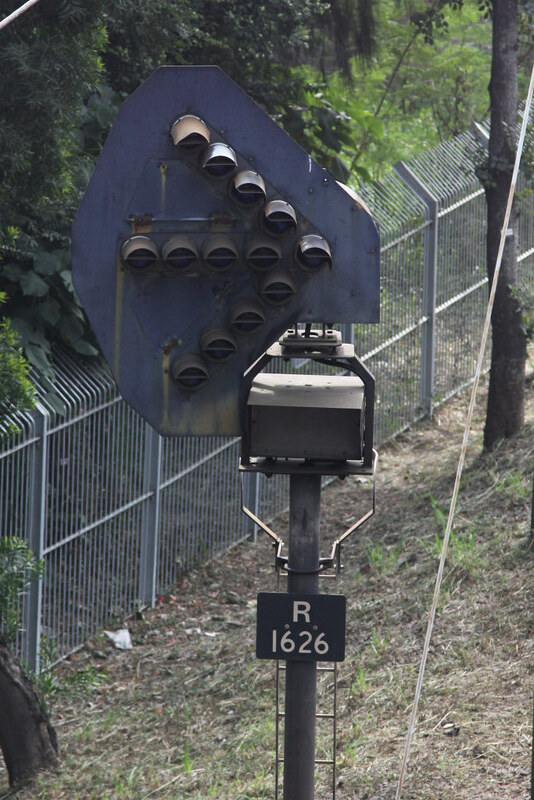 East Rail line signals are based on standard British 4-aspect colourlight signals and date to the KCR modernisation and electrification project of the 1980s, having been influenced by the involvement of Transmark, the consultancy branch of British Rail. 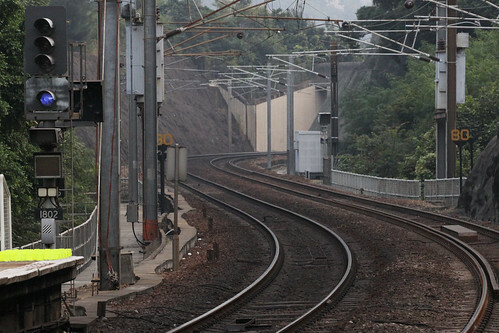 The signals remain in use today despite the use of more advanced ATO systems onboard the MTR trains, as the various Intercity Through Trains still share the route. Signals show either three or four standard aspects, as well as a “bonus” blue one. Red is for stop. Single yellow is for caution, be prepared to stop at the next signal. Double yellow is for preliminary caution appears on some signals, to indicate the next signal is displaying a single yellow aspect. Green for clear also exists, but is little seen due to the high traffic density on the line. It took me quite a while to get to photograph one! The “bonus” aspect is blue, and was added to signals after the introduction of the Automatic Train Operation (ATO) system in 2002. 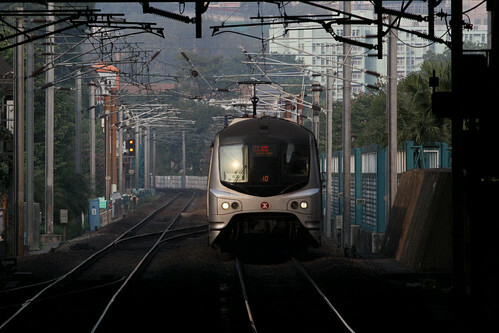 This aspect is only shown to trains with ATO equipment installed, and indicates that the train may ignore the signal, instead proceeding at the speed indicated on the onboard display. The extra ATO signal head is located separate from the main signal heads, with the antenna for the ATO system being the white box to one side. 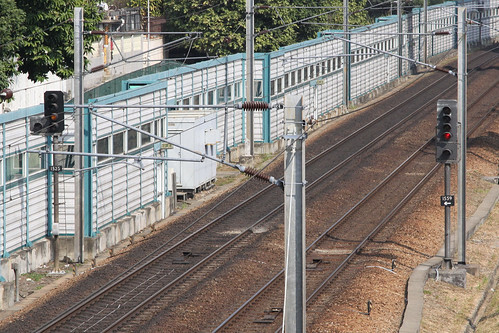 Signals along the line allow for bidirectional operation, and each is numbered: odd numbers facing northbound trains, and even numbers facing southbound trains. 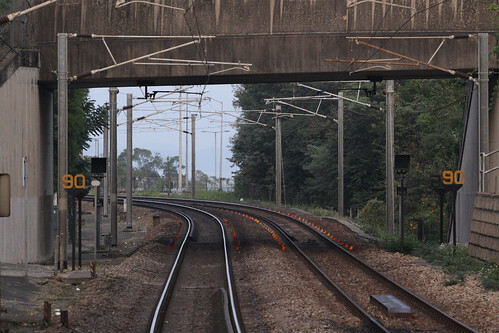 The count on the signals increases as you head north, and ‘wrong sided’ signals have an arrow on them indicating which track they apply to. At major junctions “feather” type route indicators are provided on the home signals, with signal repeaters also provided where sighting is restricted. 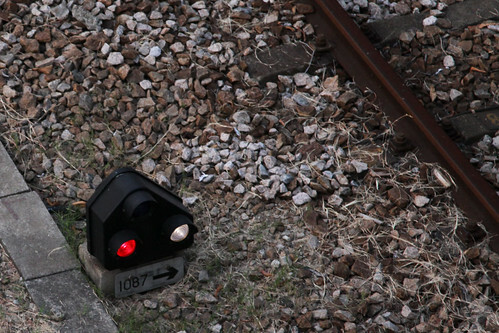 Repeater signals are prefixed with a ‘R’ – this repeater is provided with a “feather” route indicator with an array of white lamps while the box below the signal displays a single white light when the associated signal is cleared. 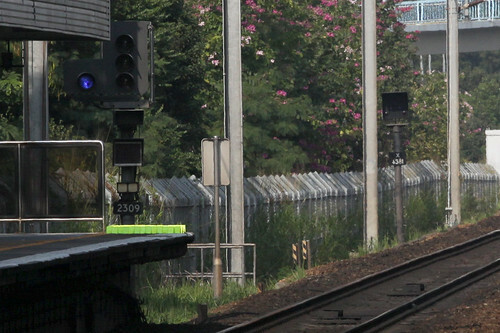 Shunting signals in yards also follow British practice – I don’t quite understand them, but this one is at stop. Yet another British influence is the speed limit boards for curves: metal numbers in yellow are used, displaying the permitted speed in kilometres per hour. Speed boards for diverging routes are similar, but with the addition of an arrow below the numbers. 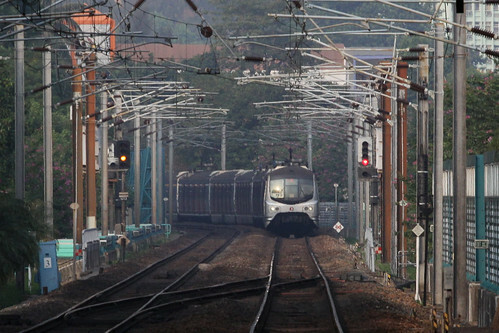 Train detection is achieved by a mix of track circuits and axle counters. 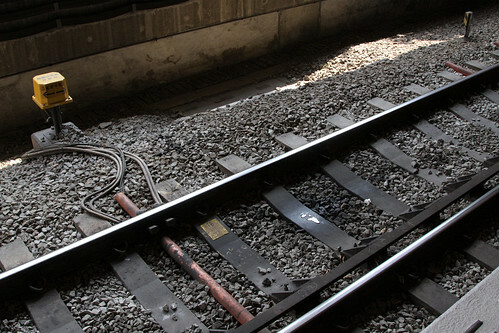 The original train protection (ATP) system on the line was the British Automatic Warning System (AWS). 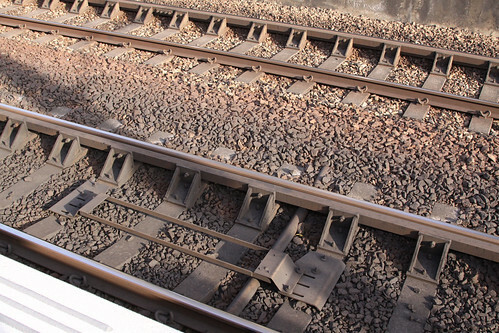 Paired magnets and electromagnets are located between the rails, and when activated they trigger an alarm inside the train cab, alerting the driver that the associated lineside signal is at stop. 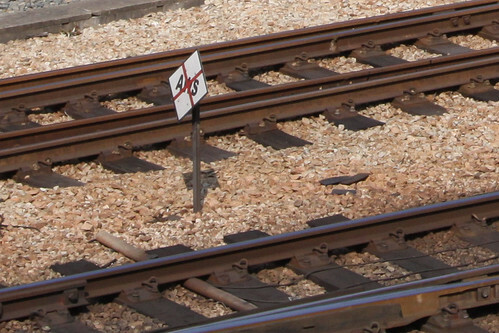 Despite the bidirectional signalling, ‘wrong direction’ movements are not normal, so no AWS is provided for signals that apply in the wrong direction. To indicate this to train drivers, “Commencement of Special AWS Working” signs appear along the line, again of standard British design. 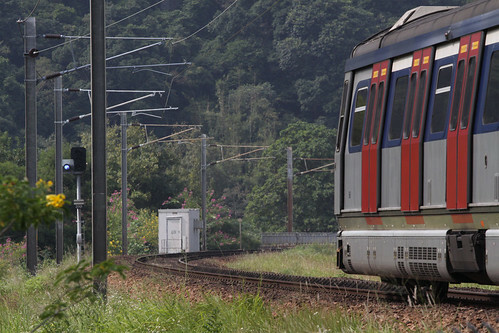 The modern form of ATP used on the line is Transmission Beacon-Locomotive (TBL), a system from Belgium. 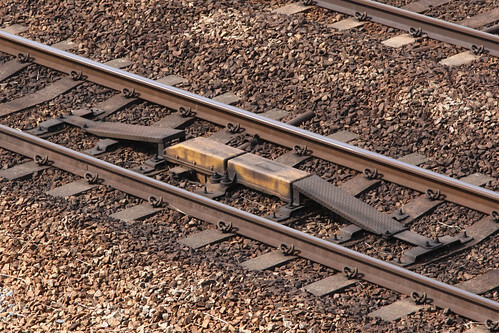 This uses inductive loops and coils located between the rails, to transmit more detailed information to trains. 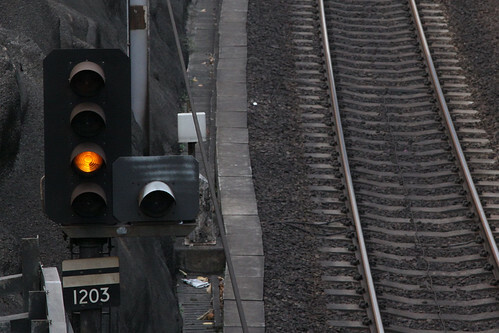 The final type of signal on the East Rail line is associated with the ‘Emergency Stop System’. Prefixed with an ‘X’, a number of these indicators are located at the departure end of each platform, and light up with a red and white ‘X’ when the emergency stop button on the platform is presses, indicating to the train driver to stop the train. I discussed the East Rail door close indicators in an earlier post. “Railway Signs and Signals of Great Britain” has a page on British signalling overseas, and has a bit more detail on the Hong Kong system. And finally, a short article about the origins of the KCR signalling system. This entry was posted in Transport and tagged East Rail, KCR, Kowloon Canton Railway, Mass Transit Railway, MTR, railway signalling, trains. Bookmark the permalink. Ah… always wondered about the blue signals on the MTR. The shunt signals are the same as we use here in QLD, which is also rather influenced by British Practice. Quite simply, red and white is stop, and two whites is proceed. When the whites are lit, their aspect is diagonal, much like a semaphore at proceed. You you explain the shunt signals that way it makes a lot more sense: they are a bit like the Banner Indicators that have appeared in Victoria over the past decade. I’ve never really had a good look at the signals up in Queensland – in Victoria we also had a British influence on signalling but ended up down a different track. I publish a fresh blog post every second Wednesday - enter your email address to receive each new post via email.